Do you have a Brinks security system in your home, and are wondering about your options? Brinks Home security became Broadview Security, and was bought out by ADT (Tyco) in 2009. In Febuary 2018, MONI bought the Brinks name and are working to revitalize the Brinks brand. But just because you have a Brinks system in your home, doesn’t mean you have to use that company for alarm monitoring. In fact, you can save money by switching to DFW Security – whether you keep your existing Brinks Security system components, or upgrade to our Smart Home Security System. If you have a Brinks security system in your home, it is most likely outdated. Why not bring your home protection into this century? (Without breaking the bank.) You may be surprised to know, a brand new state-of-the-art smart security system with a mobile app, wireless monitoring and more, could cost less with us than monitoring your old-fashioned Brinks system with ADT. Pay nothing upfront for your equipment, installation and activation except your first month of monitoring. Note: Please make sure you have fulfilled your agreement with any other home security company before switching to DFW. Why is Smart Security Better? 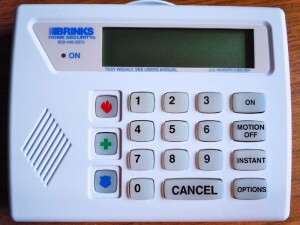 For many years, all home alarm systems were just like your Brinks security system. If an alarm was triggered, the monitoring center was notified via home phone line, and the police were dispatched after a phone call to the homeowner for verification. If a burglar cut the phone line outside the house, the system didn’t work. If you forgot to set your alarm, it did no good. Smart security systems provide all sorts of information, even when they are not armed. Thanks to two-way communication, they know when a door or window is opened, know when you’ve left the area without arming the system, and even detect when someone disables or destroys the control panel. You can operate the system from your mobile device via our award-winning mobile app, and its easily upgradeable to include home automation. If you want to keep your Brinks security system and get it monitored by their successor, you certainly can. But why would you want to? Who wants to pay more for a sub-standard product? Upgrade to DFW Security and allow us to make your life simple, safe and smart.